I have worked with hundred’s of women as a coach and more specifically as a coach helping women through breakups and divorce and starting life over as a single woman can be challenging for many women, until they reach the stage where they embrace their independence and freedom to shape their life experiences. Including the opportunity to travel, alone or with a group of like minded women and explore more about the world and the people in it as well open themselves up to wonderful experiences they had only ever dreamed about. Welcome to the Divorced Women’s Travel Club, created to showcase a variety of different travel options to open up a whole new world of opportunities for single women. 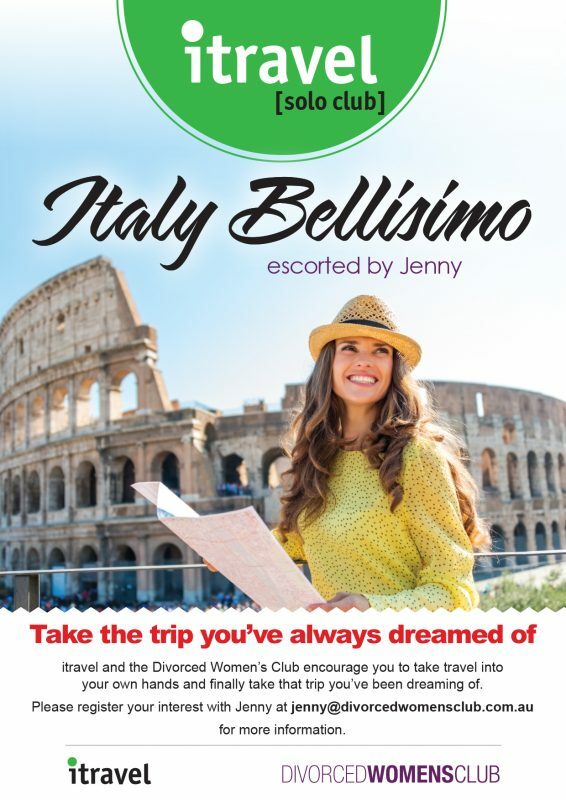 The Divorced Women’s Club has connected with itravel to bring you the opportunity to experience a fully escorted trip to Italy in April of 2017. If a couple of weeks out of your day-to-day life spent on an escorted tour of Italy with other like minded women who want to explore and create a whole lot more fun, pleasure and joy into their lives sounds appealing to you then click here so I can keep you updated with more information as it comes to hand. What do holidays or vacations really do? I think they are a chance for us to reconnect with what really matters to us – and ourselves. We step out of the daily rush of normal life and take time to breathe and have new experiences that open us up and help us grow and develop. Vacations let us reconnect and create amazing family experiences that changes our lives and are permanent memories. We all need something to look forward to; we all need to reconnect with our loved ones; we all need new and exciting experiences to keep learning and growing; we all need to stop, relax and de-stress; we all need to serve others – and we all need to take care of ourselves and give ourselves a break. Meantime – no matter how you do it, plan a future vacation. Even a mini one – so you and your family or you and your friends can re connect heart to heart and kindle the fires of joy that are already inside you. They may just be embers at the moment but it won’t take much of a vacation to fan them into a fire again. I would love to know more about doing voluntary work, what a fantastic idea and a great way of putting that smile back on so many faces who have lost their souls, their hope and the fire that once lived inside us all. Let me know how I can help. I would also love to know about any meetings you hold with likeminded people who are going through grief and sadness in their own lives where we can share our journey.